Anyone who cooks on a regular basis will tell you they feel like they get into culinary ruts. The very notion of a rut implies somehow being stuck...or maybe being boring. But the fact that we gravitate toward the familiar can be a good thing. 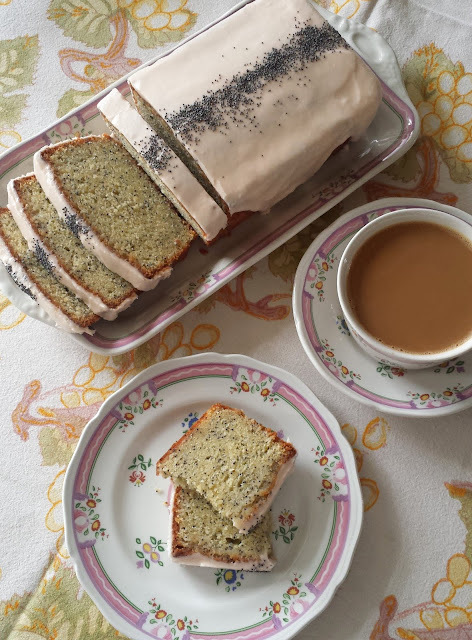 The pull of particular foods/ingredients... favored styles or food cultures... certain cookbooks/food magazines or blogs... or a group of chefs/cooks whose recipes cause you stop and take a second look, is often the source of much deliciousness. Recently, every single one of these bells went off for me when I saw Melissa Clark's recipe for Farro with Roasted Squash on the New York Times Cooking site. No matter what Clark had chosen to do with this set of ingredients, I'm pretty sure I would have liked the result.... I appreciate her style and her approach to food. 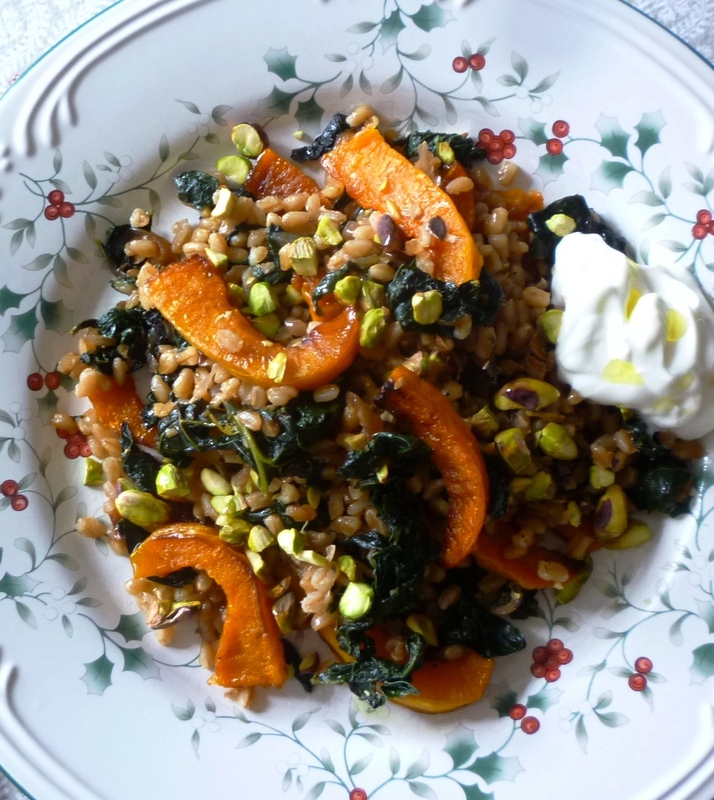 And I love farro and winter squash. All of this together made me stop and look. What inspired me to try my own spin on her recipe was the liquid she used to cook her farro: apple cider. I don't know why using cider in this way has never occurred to me (it happens to be a favored winter ingredient...I pretty much always have some in the fridge during the fall and winter months...). What a great idea. Cider adds subtle flavor, sweetness and acidity....and compliments the squash perfectly. I love apples with winter squash. As usual, I departed from the original recipe in a couple of ways. Instead of adding sugar and spices to the squash, I just tossed it with olive oil and salt and pepper. Then, I added a generous quantity of caramelized red onions and some chopped pistachios to the finished farro. Both of these added the subtle sweetness I had removed—and as a bonus, the pistachios added some nice textural interest. Finally, I served my pilaf with a dollop of labneh. I tried the finished dish with the Feta crumbles—and this was good (goat cheese would be good too)—but found that I preferred the tangy contrast of yogurt to the salty contrast of the cheese. If you are in the mood for something more salty, Feta might be the way to go. Bring a large pot of salted water to the boil. Add the kale and cook until just tender—about 5 to 7 minutes. Drain the kale, reserving 1 1/2 cups of the blanching liquid. Spread the kale on a baking sheet—or just spread out in a wide colander—and let cool. Warm 1 1/2 T. of olive oil in a wide sauté pan set over moderate heat. Add the onion along with a good pinch of salt and the pepper flakes. Cook until the onions are tender and slightly caramelized. If at any time the onions seem dry, add a bit more oil. Add garlic and cook until fragrant. Add the kale and stir to coat in the oil and onions. Cook over low heat until any water clinging to the kale has evaporated. Set aside and keep warm. 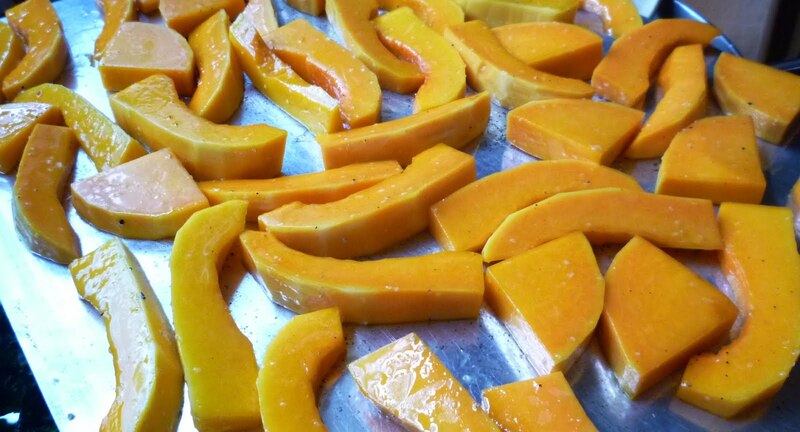 Meanwhile, in a large bowl, toss the squash with a couple tablespoons of olive oil and salt & pepper to taste. Spread in a single layer on a baking sheet and transfer to a 450° oven. Roast until tender and caramelized—about 25 to 30 minutes, flipping the squash over after about 15 to 20 minutes (wait to turn until the squash has begun to become golden on the bottom). Keep warm until ready to assemble the pilaf. While the squash, onions and kale cook, cook the farro. Place the cider and reserved kale cooking liquid in a saucepan and check for salt. 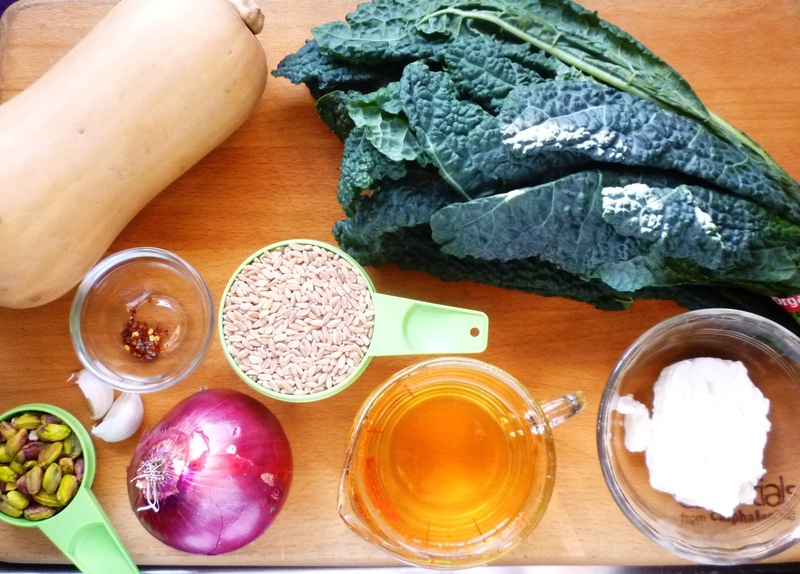 Bring to a boil and add the farro. Cover and reduce the heat to maintain a simmer. 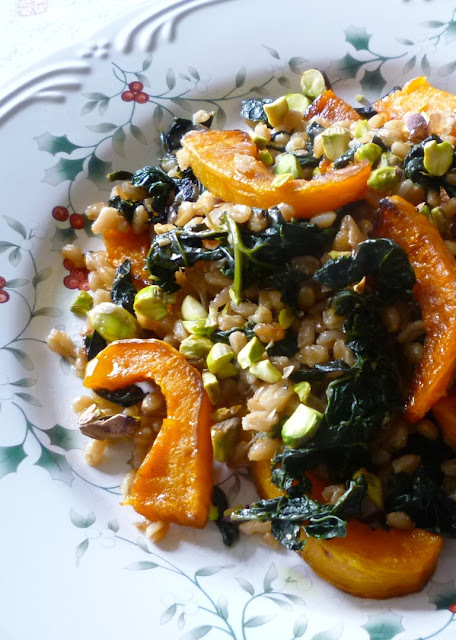 Cook until the farro is tender (but still has texture)—about 25 to 30 minutes. Drain the farro and transfer to a large bowl. Add the kale/caramelized onions along with a tablespoon of cider vinegar. Taste and correct the seasoning with salt, pepper and vinegar. 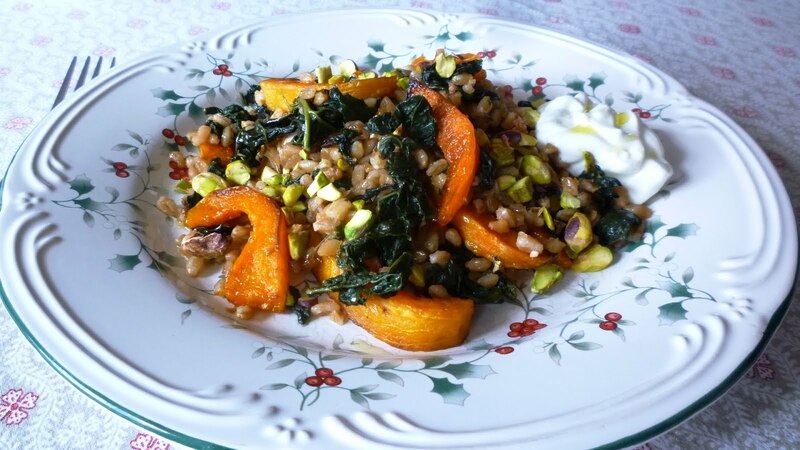 To serve, spread half of the farro mixture on a large platter or individual serving plates. 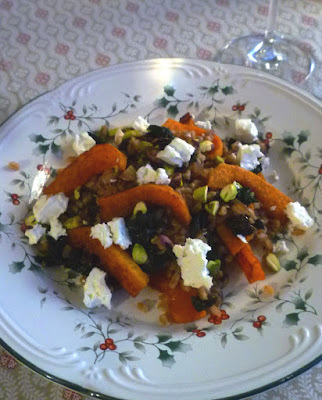 Top with half of the squash and a scattering of pistachios. Repeat this layering. If using labneh or yogurt, serve with a dollop on the side or drizzle yogurt over the whole pilaf. If using Feta or goat cheese, crumble the cheese over all. Drizzle with olive oil and serve. Serves 4. Note: Cut the cavity portion of the squash into 1/2-inch wide wedges. Cut the halved "neck" portion cross-wise into 1/2-inch thick slices. If you like, you can further cut these half circles in half—into "sticks" or quarters...as you prefer. I like this dish best made with all cavity portions as I think these 'wedges' look best in the dish. (I save the necks for a preparation that calls for a neat dice).